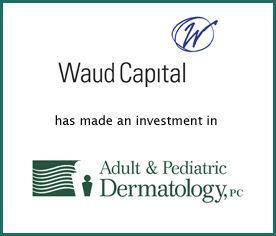 Waud Capital (Waud) has made an investment in Adult & Pediatric Dermatology (APDerm®). APDerm® offers complete medical, surgical, and cosmetic skincare for patients of all ages, from newborns to the elderly out of 10 clinical locations in New Hampshire and Massachusetts. Provident Healthcare Partners (Provident) served as exclusive financial advisor to APDerm®. APDerm® represents an attractive entry point for Waud into the highly fragmented and growing dermatology services market, and serves as a platform to execute a robust growth strategy driven by provider recruitment, new office openings, practice acquisitions and strategic partnerships. The terms of the transaction were not disclosed. “Dr. Goos (Founder) and the shareholders of Adult & Pediatric Dermatology have steadily built an exceptional platform that enables clinicians to provide the highest quality patient care. Waud Capital’s close alignment with the shareholders from a business and philosophical standpoint will undoubtedly allow the organization to efficiently grow throughout New England and beyond,” stated Ajeya Shekar, Senior Associate at Provident. Founded in 1992, Adult & Pediatric Dermatology provides comprehensive, integrated dermatology services through a team of 30 clinical providers. Adult & Pediatric Dermatology strives to deliver exceptional dermatologic care by making comprehensive dermatology services available and accessible to its patients within their communities, and supports its primary care healthcare providers with easy access and rapid communication. APDerm’s providers and staff work as a team to provide excellent, coordinated, cost-effective dermatology care. For more information, visit http://APDerm.com/. Based in Chicago, Waud Capital Partners is a leading growth-oriented private equity firm with total capital commitments of approximately $2.1 billion since its founding in 1993. Waud Capital partners with exceptional management teams to build market leading companies within two industries: healthcare services and business and technology services. Since its founding, Waud Capital has successfully completed more than 220 investments, including platform companies and follow-on opportunities. For more information, visit http://www.waudcapital.com.